I think you misattributed the word "theoretical" in that sentence. I was perhaps not clear enough. Down sampling does reduce apparent noise. In theory this reduction is around one stop. We all know that noise increases quite dramatically with MF CCD sensors and not in a linear manor once you go over 400/800. Most likely the noise increase would have been worse even with down sampling with an IQ180 80mp ISO 1600 capture. 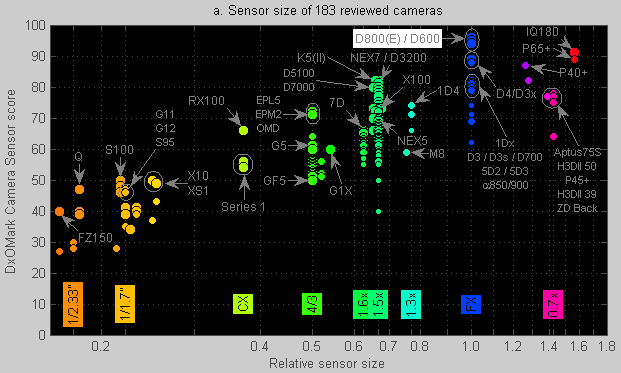 is to address the limitations of CCD sensors when it comes to high ISO. The advantage though of having sensor plus is worth noting. a 28% speed increase. There are also work flow advantages. If you are going to down sample it can be an advantage to have the camera do it at the get go. you keep in mind that you can get the Leaf form B and H as well as Adorama. I think this reinforces the argument for CMOS for MF. Lol, yes fred, Phase One's marketing department, like every other marketing department will reference and link to anyone who says nice things about them. If President Obama made an offhand remark that he thought Phase One backs produced great colors I'm sure Phase One's marketing would send out an email with that quote - that wouldn't make Obama any more authoritative on color rendering than joe schmoe. Citing P1 Marketing to show that dXo is a point of reference with broadly applicable meaning is silly. dXo have a very specific set of tests that tell you a very specific thing. They provide no useful guidance on very important nuances like what KIND of noise, how pretty the grain of that noise is, what the impact on the noise will be of using the native vs. generic raw processor, the impact of ambient temperature, length of exposure etc. If we printed 1's and 0's then they'd be everything you need to know about an image. But we don't. We print colors, and textures, and details, and tonality, and transitions and a dozen other aesthetic attributes which can only be loosely (and at great effort) be described or analyzed mathematically. The only way to really see what kind of picture a camera will take is to take a picture with that camera. Everything else is armchair analytics. As I've said a dozen times, the KIND of noise matters even more in most cases than the amount of noise. 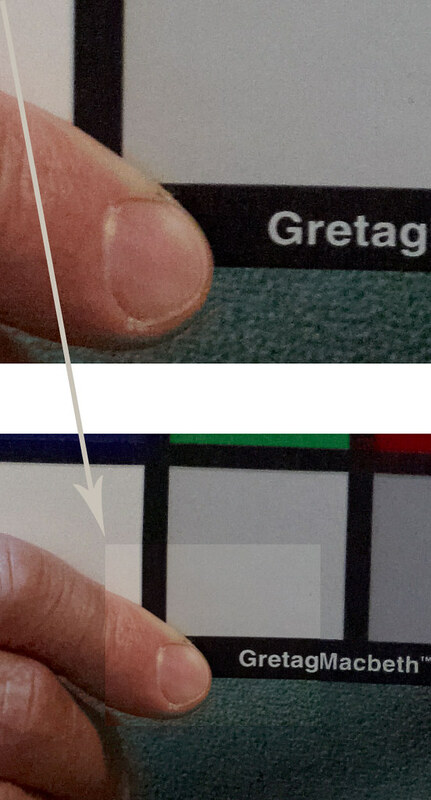 Banding, color crossover, blotchiness, low frequency color wonking, and erratic non-gaussianly distributed noise will ruin the aesthetics of an image far before a finely distributed film-like evenly structured homogeneously colored grain will, regardless of what their resulting respective SNRs (signal to noise ratios) are. We understood this in the days of film. No one ranted about scientific charts of how grainy this emulsion was or that emulsion was (or maybe they did, I was too young to have noticed); they shared and looked at photos with different emulsions to see what kind/amount/look of grain it produced. They looked at pictures. As a case in point: those images you posted were clearly processed in Capture One v6 or LR/ACR (or had awful settings applied in v7). The quality of higher ISO processing for Phase/Leaf files is remarkably better in version 7. The color bleed you see, the lack of color subtlety, and the poorly shaped grain structure are simply in your examples are absent in v7. Check out an example on our facebook page. I'm outta here for a while. This is tiring. I'll see you all in the new year. The point is Fred, there is no case that CMOS in inherently better than a CCD at high ISO, at least up to 1600. The differences are too small to be significant. The Pentax at ISO 1600 is as good as any 35mm DSLR. Except for Live View, there is no limitation to a CCD. To be fair there are many limitations on a CCD sensor. And many limitations on a CMOS sensor. What I assume you mean to say is that CCD isn't holding you back from any of the tasks you want to put your camera to. Two pieces of data posted here show that at 1600ISO, there is no falling behind with the 645D. The curve for the 645D dips a bit below he D800 at 1600, having been an almost perfect match up to 800. However, I agree that the dip is small and might not mean much, with the dark noise not being relevant until higher EI levels or if one substantially raises the deep shadow levels in post-processing. Indeed Pentax likely ends its range of EI settings (so-called ISO settings) at 1600 because it is being prudent and honest in offering just the EI settings that give reasonable noise performance when printed or displayed ”normally", without substantial raising of shadow levels. The DR graphs do indicate that as EI is raised even higher, dark noise will show up with the 645D at least one stop before it does with the D800. But how much do MF users care about such extremes of low light and high exposure index? This is what I see in LR 4.2 after lifting exposure 3 resp 5 stops (Nikon D800E and Pentax 645D, 100 ISO on both). I wouldn't judge skin tone based on Q60. The Q60 is intended for scanning and there is a sample variation, that is the reason they are always used with a reference file. I don't really agree on that. It seems from the postings on the forum that for quite a few posters (who use MFD) live view is important, and it seems that live view with present day CCD technology is not very workable. I got some communications from IQ 180 owners having both IQ180 and D800E clearly stating an advantage in DR for the D800E. One of the owners is selling of his IQ180 the other one is keeping it for resolution. I have looked at some samples myself, and this is what I have seen: http://echophoto.dnsalias.net/ekr/index.php/photoarticles/71-mf-digital-myths-or-facts?start=3 . Now, that is just a part of a longer article, and the images are taken out of context. Also, raw processors have a lot of settings and can produce very different results in expert hands. On the other hand, I think there may be a bit to much emphasis on DR. There are situations where DR is important, but in most cases it will also be limited by lens flare. Lens flare is actually one of the reasons that DR is not easy to measure, at least not with a single exposure. In my view, switching platform to CMOS would give a couple of advantages for MFD. The first one would be well working live view. It seems that feature is important for users deploying MFD on technical cameras. The other advantage would be an improvement in ISO capability. That improvement is coming mostly from reduced readout noise in CMOS based systems. Finally there is a potential advantage with CMOS in DR. I guess it needs to be pointed out that there are two different routes in CMOS. Either using on chip ADCs (Analog Digital Converters), one for each column, like in Sony Exmoor and the new CMOSIS designed sensor for the Leica M10, or off chip ADC. Nikon D4 and all Canons use the off chip converter route, loosing low ISO DR and gaining nothing. In the second case it seems that in camera electronics cannot utilize the full dynamic range of the sensor, because of readout noise. At high ISO they preamplify the signal coming off the sensor, and can therefore reach high ISO. The "you" in my post was a specific reply to TheguywiththePentax645. I was attempting to straighten out that for *him* CMOS did not have compelling advantages. For others who want/need CMOs features like video, movie-quality-liveview, or ultra high ISO CMOs offers huge advantages. Somehow I was not clear an you took the opposite meaning: that CMOS has no advantage for *anyone*. You know I don't believe that. Sorry for any lack of clarity. Everyone's ideal camera is different. Every camera (and brand or price) has advantages or disadvantages. Every shooter has different personal, business, and practical requirements an needs. For GuyWith645 to say CMOS offers no advantage for him is entirely correct, but not globally applicable to all photographers. Now I really must be going. Happy holidays. Email me if you need me. It seems from the postings on the forum that for quite a few posters (who use MFD) live view is important, and it seems that live view with present day CCD technology is not very workable. While Live View would be a really helpful feature for certain tasks it's also true that quite a few posters (who in fact use MFD) can manage to get sharp captures (even non-tethered). Reading on the LuLa-MFD forum is less and less fun. It seems there are more posts from people who have never used MFD - but draw blod conclusions from some captures they've found on the internet - than from posters who actually use MFD. This is why almost every thread is over and over flooded with the same lines of argument (underpinned by weblinks that show always the same "comparisions") and therefore many threads turn in circles. It's a shame. Question regarding CMOS. Why do all the CMOS sensors have such overlapping color filter selection? Is it so that the camera maker can get better luminosity data for higher ISO? I don't care either way what sensor is in my camera but I have found in the past that CCD sensors seem to have better color tonality and range than CMOS. You can see it in flowers, food, skin and stuff like that. Sorry, Erik and Fred, but I'm not going to post sample images. I leave this comment for to explore yourselves, but I would not be happy with a super sized D800E sensor in my digital back right now, since it still is not capturing the same color tonal range that I get even with my old CF 528 or new AFi-ii 12. Even the Leica DMR did better. What I have found, not unexpectedly, is that the advantage MF has comes from sensor size. Those advantages will not disappear with sensor development. A large sensor will have some advantage over a small sensor in many aspects. What we see is that 135 size sensors are caching up, and are good enough in some respects and actually superior in respects. I would argue that MFD has an advantage in resolution/sharpness if matched by excellent lenses and put to proper use. I would also argue that it will take long time until 135 digital can catch up as it would need a revolution in lens quality and quality assurance. Making lenses that are diffraction limited at f/4 or even f/2.8 would be a good start. On the other hand, once quality is good enough there is little reason to use MFD, if you cannot see an advantage at the print sizes you make there is little reason to use MFD, unless you have a fondness for the system. So I think that high end MF will be competitive with 135 size but I guess that 135 will affect sales of low end MF digital. Another problem for MFDs at the low end is that there seems to be a long upgrade cycle, unless you are into it for ultimate quality. The way I see it takes an innovative company to keep afloat in the MF business. Stefan Steib, the inventor of Hartblei HCam, suggested that MFD vendors sit down and develop a CMOS sensor jointly, I agree fully. I would also add that I think that Hasselblad did the MFD industry a lot of disservice making their camera interfaces proprietary. Now we have a situation where Phase One was forced into the camera manufacturing business and Hasselblad users are deprived some of the best MF backs in the market. Hasselblad users are deprived of the best MF backs in the market. what are the best backs on the market ... and why? It depends on the use ​​of it. For example, in absolute terms, a multishot DB is better than a one shot. But its use is very specific. Some will prefer the DB with the best results at high ISO. Others will choose the best one at low ISO. Each back also works with its own program, whose role is essential. This debate seems rather futile and useless. sure. as is the statement that Hasselbald users are deprived of the best MF backs in the market. Question regarding CMOS. Why do all the CMOS sensors have such overlapping color filter selection? Is it so that the camera maker can get better luminosity data for higher ISO? Yes, I think that having less noise inlow light/high exposure index situations is the main reason. One hint is that the smaller and more noise prone sensors in compact cameras tend to have even more overlap in their color filtration, going with even higher quantum efficiency values. The article below by Tim Parkin is an interesting one, but unfortunately requires subscription. Lets put it this way, some folks need live view, mostly those who want to use MFD on technical cameras. You also seem to have some idea that you cannot analyze an image that you didn't shoot your self. Can you perhaps explain why? Also, this discussion is about the direction of MF to go. Rambling about other posters view will not help anyone. I agree with Tho_mas on the recent flood of negative posting and more than enough technical babble by folks who don't even use digital MF. I don't say there isn't a place for it, but I sure liked the forum a lot better when most of the posting had to do with "which is the good lens for this platform", and "how do you do that with this camera" etc. Kind of stuff one that was actually using the gear could use. 1) Arm chair technobabble - the endless debate about what is better. Rules: No one is allowed to post about a camera they have - this is strictly a theoretical forum. No images please, unless they are of color charts, brick walls, or cats. 2) Complaints forum - This section is for those that are unhappy for whatever reason wether it was due to operator error or some other fault. Rules: No work arounds or other suggestions allowed. Conspiracy theories encouraged! You take a line of a pretty long comment out of context. But I can refrase: Hasselbald users are deprived some of the best MF backs in the market. and you may get the impression that Hasselblad is a bit behind. I would also add that I think that Hasselblad did the MFD industry a lot of disservice making their camera interfaces proprietary. Now we have a situation where Phase One was forced into the camera manufacturing business and Hasselblad users are deprived of the best MF backs in the market. Did you ever consider to make and publish any comparisons of your own? Any such comparison would be appreciated for sure. But make a sloppy one and you need to be prepared for some FLAK.